According to Ayurveda, there are numbers of natural ways to treat constipation. Ayurveda is the natural healing process which has no side effects on our body. Constipation is a very common gastric disorder in which there is the inability to pass stool. In some case, it becomes difficult and painful. According to Ayurveda, the herbs such as Amalaki (Emblica Officinalis), Haritaki (Terminalia chebula), Aloe Vera, Bibhitaki (Terminali bellerica), Psyllium Husk and Katuki (Picrorrhiza kurrao) are the best treatment. According to Ayurveda, constipation is known as Vibandh. In Ayurveda, there are three doshas (kapha, pitta, and vata). In case of constipation, there is an imbalance in vata dosha. 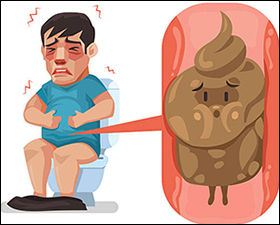 During constipation undigested food get slowly accumulated in the stomach and intestine which leads to an imbalance in vata dosha. When your digestive tract is not properly clean then there is a disturbance in your bowel movement and ultimately there is constipation problem. Amalaki and Amla is the most used herb in Ayurveda. Amla is the very good antioxidant and protects our body cells from oxidative damages. According to Ayurveda, this is the best herb for constipation problem and medicinal properties of Amalaki are: it is sour, bitter, sweet, astringent, pungent in taste, coolant in qualities, after digestion it undergoes sweet taste, coolant in qualities, and cold in potency. Amalaki facilitates the digestion, to regulate the proper digestion and elimination of waste. It has been used in Ayurveda from centuries. It is the best treatment for constipation patient. This herb has great antioxidant, anti-inflammatory properties which provides protection from oxidative damage. Due to its coolant properties, it helps to balance and pacify pitta in the body. Regular and daily consumption of this herb provides you with a good amount of vitamin C to your body. Due to all these properties, you should add this herb to your daily diet because it can also boost your immune system. This is one of best herbal treatment for constipation. It is distributed in South East, Sri Lanka, Nepal and India and it belongs to the Combretaceae family. Regular and continuous consumption of this herb during constipation will ultimately improve your disturbed bowel movement and also increase digestion power. According to Ayurveda, this herb is, hot in potency, pungent, bitter, sweet, sour, astringent in taste, light and dry in qualities, and after digestion, it converts into a sweet taste. Haritaki has very good laxative and carminative property which is also good for proper digestion. Like Amalaki, this also contains antioxidant property. Along with constipation, this herb is also good for skin problems, weight loss, heart conditions, diabetes, and also cleanse the urinary tract. The scientific name of the plant is Aloe barbadensis and it belongs to the Liliaceae family. Aloe Vera has powerful anti-inflammatory, antioxidant, anti-fungal antibacterial properties, which helps in various body ailments. It keeps your body healthy and protects it from various bacterial and fungal infection. Aloe Vera is the succulent plant mainly grow in dry, tropical areas. According to the Ayurvedic point of view, this herb is cold in potency, bitter in taste, oily, sticky and slimy in qualities. It also balances all the three doshas (kapha, pitta, and vata). This plant grows up to 60 to 100 cm in height and stems are green in color. Aloe vera juice is the best herbal treatment for proper digestion, you should drink it before your meal. This will helps to cure gas, bloating and constipation problem. It is the plant which mainly grows in the Himalayan region. In Ayurveda, the roots and rhizome of the plant has been used for various treatments. Katuki is known as a cooling agent, which helps to remove excessive fire energy from the body. Katuki balances the pitta and kapha, which can cause digestion and acidity problems which helps to improve digestion, metabolism of carbohydrates, proteins, and fats. There are some phytochemical in this herb such as pikuroside, phenol glycosides, 4-hydroxy-3-methoxy acetophenone, veronicosides, and cucurbitacin glycosides. According to the Ayurvedic point of view, this herb is cold in potency, bitter in taste, light to digest, and undergoes pungent taste after digestion. Laxative in this herb helps to control the bowel movement and helps to ease the constipation. You should add this herb to your diet during constipation. This is one of another herb used for digestion problem. The oil obtained from these seeds of this herb is cold in potency and due to this property, it will help to mitigate pitta and vata dosha. It treats not only constipation problem but it is also good for diarrhea. Due to the laxative action of this herb, it will help to treat constipation and make your stool soft so that it can easily pass through the intestine. In Ayurveda, the medicinal properties of this herb are light to digest, astringent in taste, dry, hot in potency and undergo sweet taste after digestion. Psyllium herb is rich in fiber so it helps in constipation. During constipation add one tablespoon of psyllium husk to one glass of water and drink it. You can also blend psyllium husk in your smoothies. This herb is cultivated all over India. In Ayurveda along with constipation problem this herb is also used for diarrhea, diabetes, weight loss, lower high cholesterol level, and has a prebiotic effect. The use of these herb will improve the digestion and increase the digestive fire (Agni). Improvement in the system will make the stool soft, regular and get rid of constipation.